determining the types of activities the water should support by establishing designated uses[learn more]. developing water quality criteria to protect these uses from excess pollution [learn more]. identifying general policies to implement these protection levels in point source discharge permits [learn more]. Water quality standards are important because they help water quality managers protect and restore the quality of Wisconsin´s surface waters. 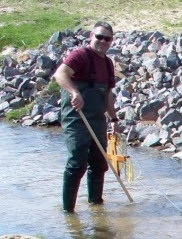 Revisions to the processes that DNR uses to classify and assess the state’s waters. This include adjustments to Wisconsin’s designated uses, development of biocriteria and creation of a process for selecting site-specific criteria for phosphorous. For a brief description of these revisions, visit our DUBC rule revisions page. Revisions to Wisconsin’s designated use and water quality criteria for recreation. For a brief description of this revision, visit our recreation water quality standards revisions page. The establishment of permit limits for wastewater discharges to protect the State’s waters [learn more]. The development of Total Maximum Daily Load (TMDL) analyses which determine how much pollutant reduction is needed in a watershed to protect water quality [learn more]. The development of water quality management plans which prescribe the regulatory, construction and management activities necessary to meet the water body goals [learn more].